In the opening story to a promising crossover, cold hands don't equate to a warm heart as an emotionless killer defeats Team Flash for the first time ever. And he isn't even a Metahuman! As much as I love Grant Gustin in the role of Barry Allen/The Flash, his character, at this point, still comes across as an overgrown boy and for me, it can get a little annoying at times. But maybe the show is going to do something with that, maybe what happened to him in the past and his quest to release his father from prison has kept him stuck in the past? It will be interesting to see how the show deals with that but for now, I wasn't overly impressed with the opening sequence where we see Barry playing a multitude of games to test his mind when he is running. Playing ping-pong with Cisco, Operation with Caitlin and Chess with Wells only emphasises one thing, Barry can't win at chess, so he clearly can't win at adult games because he is still a little too childlike. Perhaps that's me looking too deeply into it but that was what I got from the opening scenes. What I did like though was when Caitlin, a doctor herself can't get the objects out without setting the buzzer off. I laughed as she looked around and said, "What? It's harder than it looks!" As I stated above, this episode crosses over with Arrow, or more specifically, the character of Felicity Smoak. In the Arrow episode which coincided with this one, Felicity received some real heartbreak when things didn't work out with Oliver Queen, as he wasn't ready to be that way with anyone just yet, plus he had all the league of assassins business to deal with in the slightly dreary third season of the show! I found Wentworth Miller instantly likable in the role of villain, Captain Cold. Cold is essential the Flash's version of Mr. Freeze. At first, Captain Cold comes across as a numbers sort of guy. One of his first lines is '182 seconds," as his team sets out to steal a diamond shipment and it is very reminiscent of the Arrow villains, who are always so precise. Luckily, their attempted hijack of the diamond shipment is foiled when the Flash turns up and stops them. And the Flash manages to catch Cold's face, which he then identifies through his police sources. Leonard Snart already has a criminal record and a rather nasty plan in mind. He manages to get a hold of an old weapon that Cisco had made a little time before the events here. It is in this episode that Barry experiences his first failure. Although he is fast, at this point in his development, he can't be in two places at once and a man dies because he couldn't save him quickly enough. It leaves Barry racked with guilt. Barry hasn't had enough at being a superhero to take the responsibility for the death in his stride but why doesn't Cold just kill Barry when he is grieving? Is it all part of his plan? As well as life as a superhero, Barry doesn't have much experience with life either. Felicity is obviously throwing feelings Barry's way but rather than noticing these things, Barry seems happy enough to act like someone in the closet. I get it, there are guys out there who act asexual so that they don't risk being available to object to their affections. But it is Felicity I feel sorry for here, she goes out and buys herself a clearly expensive dress that does make you wonder what Barry is waiting for. Unfortunately, love has to wait as The Flash has one more confrontation with Captain Cold. Cold attacks a train this time and he plans to compromise and overpower Barry, in order to probably kill him and we get to see another fight sequence full of brilliant special effects. 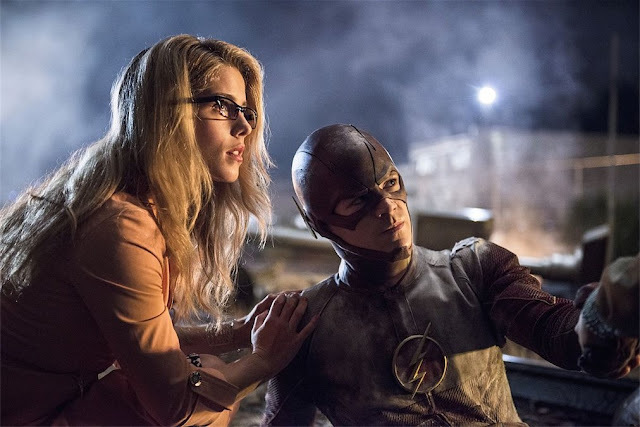 Barry appears to be at Cold's mercy when the tables are turned by the arrival of Cisco, Caitlin and Felicity. They tell Cold they will kill him if he doesn't leave them alone and their bluffing is delightful to watch but it does more than that, it demonstrates to Barry how dedicated to doing good and helping people Cisco and Caitlin are as Barry needs to know there are people out there that he can trust. Felicity is super intelligent and she pegs that Barry fancies Iris from the word go. Felicity and Barry get a goodbye kiss which feels completely natural but painful for Felicity as it looks like she isn't going to get either of the men she likes. And as Felicity leaves Central City, there is one lingering question left answered. If a normal human with a superweapon can terrorize the city by being on time all the time, then what will happen when someone with an unhealthy obsession with calendars turns up?